The White-backed Vulture, Gyps Africanus, is the most common vulture in our area. It is so named because of the white feathers on the lower back, best noticed when the bird is in flight. Large numbers of these birds are seen at kills. They have extremely good eyesight and from high in the sky can detect carcasses from as far as at least 10 km away. Once they descend, their flight pattern is usually noticed by others : predators such as lions and hyenas that are looking to scavenge rapidly move in the direction of where the vultures are landing. Anti poaching patrols do likewise hoping to catch their quarry red-handed. 1. Superstitious and gullible villagers are conned into believing that if they buy medicine (from a witchdoctor) that includes the eyes of a vulture, then they will be able to see the future. 2. Poachers who realise that the descent of vultures to their kill can give their presence away are inclined to poison the carcasses. 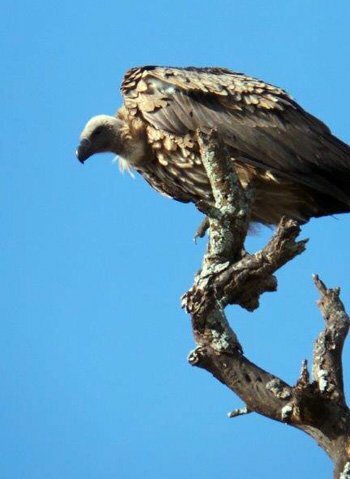 Both the above have resulted in a decrease in recent years of the number of White-backed Vultures in the Kruger Park. In 2012 its status was downgraded from “Near-Threatened” to “Endangered “. White-backed Vulture at a recent kill at Tremisana Lodge. These reports are appearing in the order I receive them, no favouritism !!! It’s happening again at Tremisana lodge : the bush is looking good and green – good for the animals but it is hard for the viewing. I have seen our biggest tusker, Ezulwini, a number of times this month. He is a very good elephant and he’s relaxed. Halala ! Good photo of Ezulwini, our biggest tusker. Bush walks have seen an improvement from last month : giraffe, zebra, waterbuck, hippo and crocodile are seen on just about every walk. 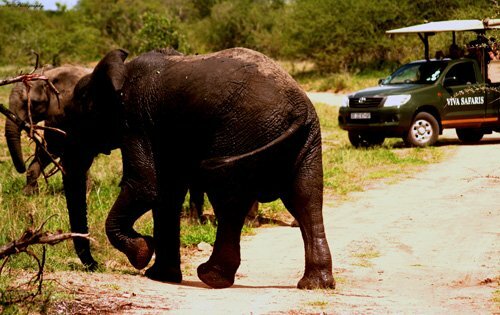 Afternoon and Sunset drives have yielded good sightings of elephants as well as both Black and White Rhino. The predator sightings have also improved : there have been regular sightings of lions, leopard , hyena, genet, jackals, civet and honey badger. A pack of 16 Wild Dogs came towards the middle of the month and took out some impala. 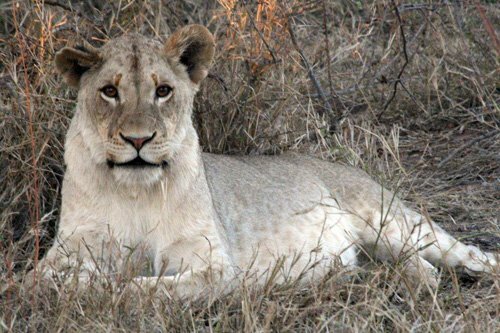 We have seen lions almost every day, including sightings of a White Lion on the Nwanedzi roads. Elephants and buffalo have been seen every day and White Rhino and Leopard sightings have improved from last month. There have been some specials including sightings of Cheetah and Wild Dog. No other word could describe this month other than Excellent!!! The increase in vegetation and rain we received have made miracles in the Bushveld bringing us amazing scenery and sightings! We have had the pleasure to share this beautiful lush African bush-veld with our guests and introduce them into the traditional ways of African people including medicinal uses of the bush. We had many encounters with hippos and crocodiles while conducting our walks near the Olifants River. I am really enjoying these amazing drives that allows our guests to stop awhile and enjoy the scenery while watching the sun set with some drinks and snacks. Amazing encounters on this drive with both big five and general game. These yield the most animals : regular sightings of Lion; Leopard; Elephant – it has been a privilege to see all these animals on the first drive that our guests have – it truly gets them all in the Safari spirit. It is wonderful to hear their reaction as we arrive at the candle-lit Marula Boma for dinner. Also when they get to meet the hyena and honey-badgers; we have even had a big Bull Elephant drinking from the watering hole and heard the jackals and lion calling in the distance. Real Magic ! Overall it has been an amazing month and each time I think it can’t get better, it does. It is a privilege to be able to work in the bush and pursue my lifelong dream; having the ability to share it with guests from all over the world makes it even more worthwhile. I enjoy each and every second of it and I love the smiles it brings to people’s faces. I am looking forward to April. Andy and I were both pleased to see the dense vegetation by the river. We walk even more cautiously. We heard a branch being broken – Andy went to have a look – a herd of elephants was making its way from the river. Listening to them going through the bush was great – the guests were so impressed ! That day we had a great sighting of a mother Hippo with her brand new baby. We had one crazy morning, there is no other word for it. Near Tremisana I saw some lion scratch marks. A few metres further we saw them : Wild Dogs – they we’re on the other side of the fence having breakfast (an impala). The lions (turned out to be a male and a female) had scratched on more than 200 metres along the fence trying to get to the Wild Dogs’ impala. We found the lions further on. A few metres further we found a mother Black Rhino and her calf – the lions gave them a wide berth. The drive started quietly. When we arrived at a dam wall, I could see that there was a bull elephant in the distance so we started making our way there when all of a sudden I glimpsed a rhino. 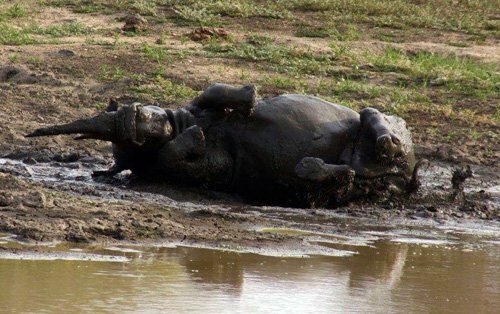 The White Rhino came down to the waterhole, sprayed his territory, went and rolled in the mud for a good 15 minutes then eventually drank some water. Rhino having a good roll in the mud. It was just so magical to be there and to witness it, especially because it was the day after we’d heard that the northern white rhinos became extinct. It was like a reminder that not all hope is lost, there are still some rhinos to take care of – the battle isn’t lost. I am crazy about elephants, however on this particular day I wished we had not met up with this particular breeding herd of elephants. My guests and I had a close and adrenalin-filled encounter. The matriarch called every one of them (around 9) and they all came for us. We luckily got out of this uncomfortable situation all in one piece. Let us please all remember that we are dealing with wild animals in their home, and we must never take anything for granted. The behaviour of this scene was absolutely amazing to witness and so we all learned quite a bit that day. 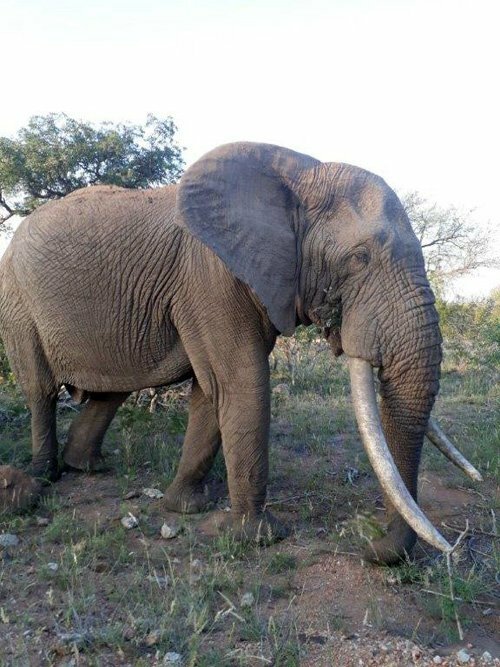 We managed to find Ezulwini (one out of 12 of the great tuskers of South Africa) – he was on our property Tremisana – we had some time with him and as usual he was so chilled. We then found a numerous amount of impalas, zebras, kudus then eventually I saw a small grey mass on the ground – what I thought was a weird looking warthog turned out to be a baby rhino – we only figured when we saw the mother. On the 2nd of the month at Tremisana there were 8 bull elephants, one of them was at the gate by the car park, he was very relaxed, eating from our Marula tree. On the 4th on Barnard we found five lionesses around Ngwenya Dam trying to catch a zebra, but the impala saw them and started snorting and so the lionesses failed. On the 7th we found a male black rhino (ZULU), he came to us as usual, charging first, and stopped about 5 metres away from the Cruiser, just enough space to find out who we were. On the 21st at Tshokwane we found a pride of lions on a zebra kill. 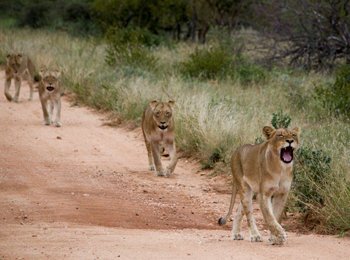 On the 22nd at the Olifants road junction with Sable road there were 3 lionesses having a kudu as meal, that kudu has been pushed towards the fence and that is how they got it that easily. On the 25th we found a leopard on the H-6 Shishangaan loop with a porcupine up a Leadwood tree. 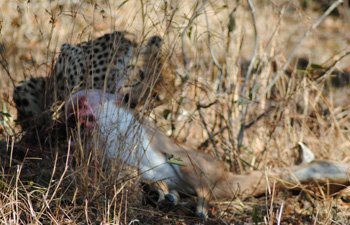 While we were watching, the carcass fell down and the leopard came to ground and carried on eating the porcupine about 2 metres from us ! Wow ! On the 27th on the H-7, about 4 kilometres from the reception we found Wild Dogs that had killed an impala. A hyena came, took the impala and left the scene running into the bush. 2nd : Buffalos on Rabelais, elephants Nsemani, lions s41. 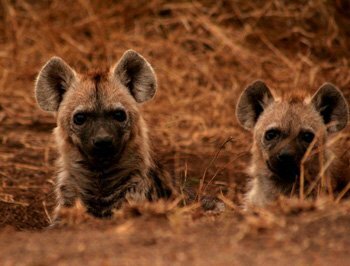 Hyena clan with young on Orpen road. 5th : Hot day again: White Rhino crossing the road before reception, elephants Timbavati river bed, lions Nsemani dam, leopard on s100 up a tree and buffaloes on Sweni road. BFBL – Big Five Before Lunch !!! 11th : h7 a lioness with a wildebeest kill next to the road, elephants on h7, ostriches on s127, lions on s39. White rhino before the last boom gate. 18th : elephants after the boom gate, lions s106 road, another pride on Timbavati river bed, cheetahs on h7, Buffalos on Sweni road and more elephants Welverdient waterhole, wild dogs at Rockvale waterhole. 26th : elephants before reception, white rhino before reception, lions on 106 road, ,lions s100 road, Buffalos Welverdient waterhole, a clan of hyenas on s36 road, a leopard crossing near Bobbejaankrans. 27th : Lions s100, ,Buffalos Sweni road, Wild Dogs Ximangwanini dam. This is still one of best activities at Tremisana and we have had great sightings lately of general game as well as Hippo and Crocodiles. 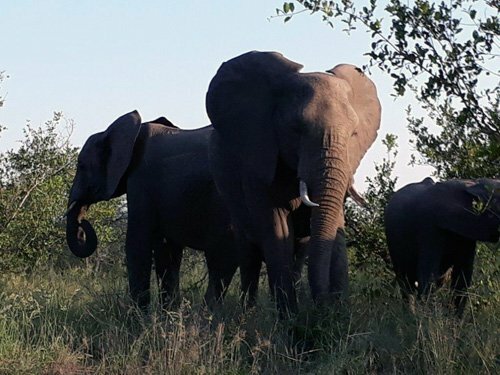 We have been spotting more Elephants too – all in all great time on the Olifants River. We saw a young lion on the way to the river – relaxed and photogenic ! So the day started off very cloudy in the morning on the way to Kruger after a really good breakfast at Marcs Camp. As we entered the Orpen Boom gate we got 2 big African Elephant bulls close to the open vehicle.We got buffalo on Rabelais loop. Getting my guests close enough fo a great photo! We viewed some Baboon babies climbing Marula trees and playing with one another so human like. :).We saw an endangerd white headed Vulture and Southern Ground Hornbill at Nsemani Dam with a pod of Hippos including Babies as well:).On the otherside of the dam there was a small breeding heard of Elephants. Wethen had a sighting of a Lioness on a baby gnu kill. Across the road Hyeans were waiting for the lioness to finish – what we didn‘t know was 500 m ahead there was two Cheetahs sleeping – what a Bonus all on one Road!!! We got more Buffalo at Welverdiend waterhole. I look forward to April and its great sightings. Tremisana has had reasonable rain – the dam is still over 90% full. We have had regular visits from a female leopard who is unconcerned about how near she is to human habitation. We know she is around as the monkeys go mad – high up in the top parts of the palm trees they have a great view of the surrounding bush and give their warning calls. Marc’s Treehouses has had more rain than Tremisana and the grass is high. There are many nyala babies to be seen around the main lodge area. Impala numbers are up as well as the number of buffalo sightings. Katekani has a big male Leopard leaving his tracks all over the roads. He seems more cautious than the one at Tremisana and is seldom seen. We do hear him as well as the Kapama lions. Katekani shares a fence with the Big Five Kapama Reserve. March 2018 was a busy month – thanks for your support. Despite the 1% increase in VAT, effective 1 April, we shall, as always, absorb costs and maintain the advertised tariffs until 31 December 2018. But especially the people from Tremisana made this so special for us. The staff is very great! The “organizers” who tell you what is going to come up next, so you don’t have to care, the kitchen staff who prepared the best African food (also for vegetarians – you are the best! This was so delicious), and last but not least the passionate rangers, who not only act as teachers of the wild but also pass on their excitement about nature. Even though wild animals are hard to spot sometimes, there is so much more to learn about flora and fauna besides the “big 5”. The long way coming from Johannesburg as well as the money pay off many times once you enter Tremisana. The rooms are fine, when you think of where you are, you so much appreciate running water and good WiFi connections. The facilities are just amazing: bonds, trees, swings, Lapa (where you eat breakfast) with view on a water spot preferred by warthogs, birds and monkeys are better than every TV channel. My two roommates and I travelled to South Africa and Kruger, from the states, for the first time last November and we stayed at Marc’s Treehouse camp for 4+ days. 1. Because the pricing was amazing!! 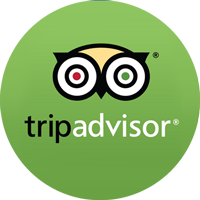 (Kruger has always been “bucket list” for me as I never thought I could afford the accommodations and the excursions). 2. Because we really wanted the “camping in the bush” feel. Marc’s blew our expectations out of the water! It’s rustic and fantastic! We stayed in the 4-bed tree house and had a blast! I thought we would be cramped with three people, but the space was huge. The bathrooms were directly outside the front door and the balcony was ideal for listening to the local wildlife (buffalo trudging through the stream below!!). The staff was more than accommodating. For the short time we were there they were like family! Charl was not only an amazing host but such a knowledgeable and fun park guide as well. He really went above and beyond to make the trip memorable for our whole group. Over all we had the most amazing time. I would go back in a heartbeat and I would recommend Marc’s to anyone looking for a real camping in the bush experience! Mai come questa volta ci siamo sentiti coccolati. Abbiamo trascorso 4 giorni in mezzo alla natura in questo bellissimo lodge con tutti i comfort nel rispetto dell’ambiente. Ringraziamo il tour operator south african dream per averci consigliato questa struttura. Le camere molto ampie, pulite e ben arredate. Piacevole tornare la sera dopo i safari e trovare la camera pronta per la notte con le luci soffuse. Un sentito ringraziamento a Margaret, che ci ha sempre preparato ottime cene e abbondanti colazioni, ed a tutto il personale che ci ha fatto sentire a nostro agio. Ottima atmosfera del luogo con gnu, kudu e scimmie che ogni tanto venivano a trovarci . Esperienza che consigliamo e che speriamo di ripetere.